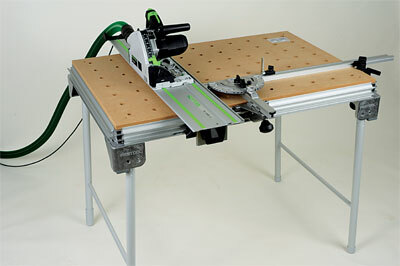 Is the Festool MTF 3 a pumped up picnic table or a serious contender for the ultimate piece of shop/site equipment? I've seen the MFT 3 on numerous occasions at trade shows and in dealers' shops over the years but never had the opportunity to really assess the system and how it might begin to justify the investment, let alone the space in the workshop. In essence it's a modular work platform with plenty of scope for holding all manner of workpieces on the top or the side. This in itself is not a new concept and not sufficient to prize me and my hard-earned away from each other. It's not that difficult to transport yourself between workshop and site these days without losing the ability to perform most tasks, but Festool is one company that has made this a viable option with the introduction of a fully functioning system. 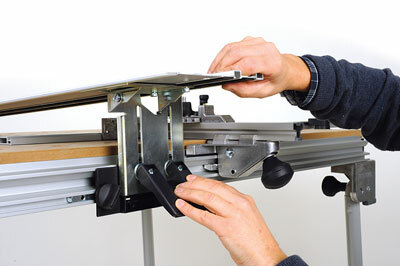 A mobile workshop is one thing, but maintaining workshop accuracy is quite another. So what if I said I could save you a wad of cash, add a few more strings to your bow and make it something you can take with you? Presumably you'd want to know more. Well the MFT 3 could be the answer. Unless you can accommodate a large panel saw for reducing sheet material then you'll be using a circular saw or ordering material pre-cut to size to get you underway. The chances are you might have a mitre saw, and no matter how accurate they are there is a limit to their cutting capacity. The MFT 3 gets round this by adding a saw guiderail to an adjustable fence to achieve cuts up to 700mm wide, 78mm deep and at any angle up to 89°. What's even more impressive is you can pack it up and get the same results on site. First of all, the MFT 3 is collapsible. The legs fold up under the table and lock firmly into place with four easily accessible knobs. 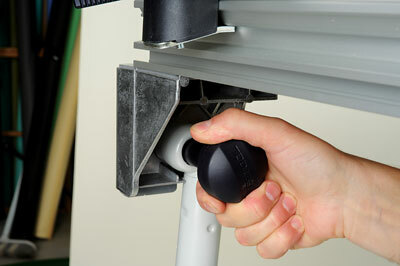 A single leg is adjustable in height to counter any uneven surfaces. The perforated MDF worktop is framed with an aluminium extrusion designed to accept a range of accessories - a guiderail being one of them. This useful extra locates in position courtesy of factory-fitted stops contained along the two long sides. It's hinged at one end and guided onto a pin at the other to remain perpendicular to the extrusions. 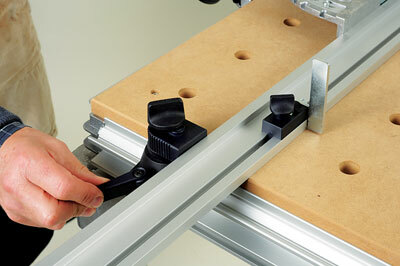 It can be used to mount either a plunge saw or router. A mitre fence is positioned alongside the rail to which the angles can be selected. At the other end of the fence there is a clamping device to hold it in place. The system is not complete without either the TS 55 - reviewed in F&C 196 - or TS 75 circular saw. Either of these units is worth further investigation in their own right as stand alone machines. 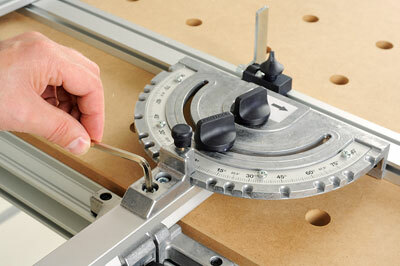 Their depth of cut adjustment mechanism is key to obtaining the best results from the MFT 3 table. In practice, the processing of components is far less arduous than using a tablesaw once you are familiar with the setup. Either of the circular saws mentioned will cut on a bevel, so, by adjusting the fence angle on the table, compound mitres are also possible over a distance that will make your chop saw seem rather inadequate. Given that they are prone to throwing dust everywhere and tablesaws require considerable extraction to make it worthwhile, this represents a very pleasant option. Oh and I'm not done yet. Ask yourself where will my hands be in relation to the blade when it's spinning? About as far away as they could safely be - that's where! By my reckoning I have saved you at least £1,000; made you as good on site as you are in the workshop; drastically reduced the risk of personal injury and created some space in the corner of the room. The pleasure is mine, you can thank me later.